South Africa – Rhino death toll hits 251 « What Happened to the Portcullis? According to the latest data from South Africa’s department of environmental affairs (20 June 2012), the total number of rhinos poached since the beginning of this year now stands at 251 with the number of arrests at 170. The North-West, KwaZulu-Natal and Limpopo provinces continue to be targeted by poachers, collectively accounting for 86 of the total rhinos poached this year. The Kruger National Park, alone, has lost a total of 149 rhinos since the beginning of this year. At this rate the carnage will almost certainly exceed the 448 slain last year. 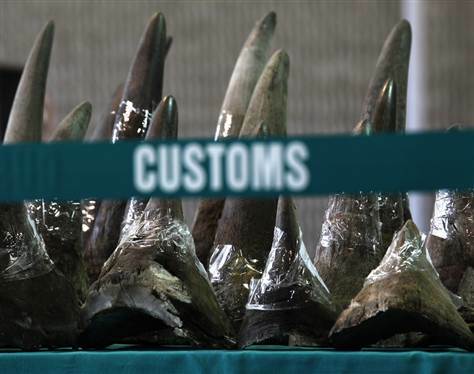 Thus far, a total of 170 arrests have been made of which 147 of the arrested were poachers, 10 receivers or couriers, six couriers or buyers and seven exporters. Elephant and rhino poaching is surging, conservationists say, an illegal part of Asia’s scramble for African resources, driven by the growing purchasing power of newly affluent Asians.